First things first, I'm excited to debut Eco Cajun's new website look! I had a lot of fun giving this site a fun little facelift, and I love how it turned out. I'll refresh the featured blog posts in the top slider on the homepage every so often so it keeps things updated a bit more. Second piece of housekeeping, if there's a topic you're interested in learning more about on the blog, leave a comment and let me know. I've been in somewhat of a rut, creativity-wise, so I'm open to ideas to add to my content schedule! I definitely talk a lot about how to reduce waste through reusable mugs, cloth bags, and stainless steel straws. But there's another way I try to reduce paper in my everyday life - by going paperless with my phone! I'm already on my phone pretty often, whether for personal use, blog-related things, and work-related social media. So it's pretty natural for me to find paperless options for different parts of my day-to-day routine. The biggest switch I've made is saving on paper for grocery lists (which inevitably get destroyed by the time I get to the grocery store), and I use an app called Out of Milk. I've got a grocery list, drugstore list, and pet store list, and I add items as I think of them, or sit on a Sunday morning and plan out my grocery haul for the week. As I'm shopping, I can check off items, keeping myself somewhat organized. Full disclosure, I honestly liked the app a lot more on my Android phone, and find the iPhone app is crappier, so one of these days I'll look at finding something I like more. 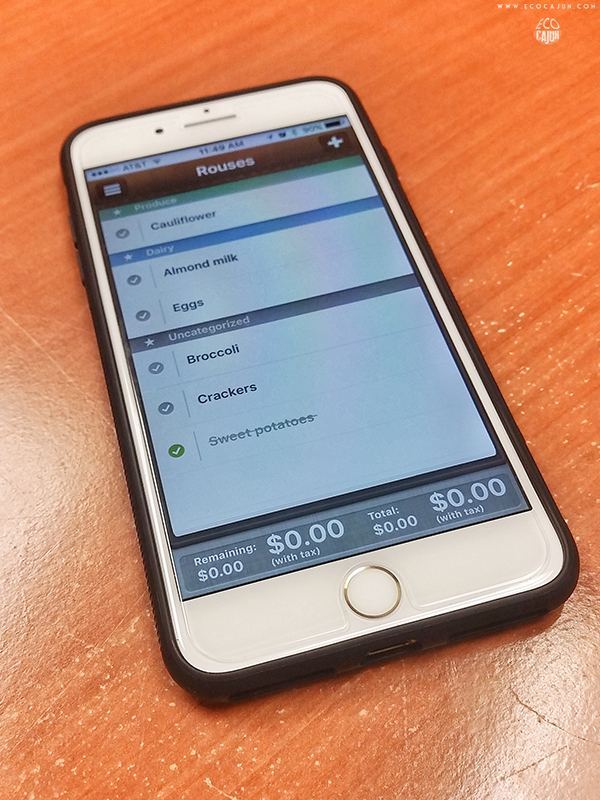 There are tons of grocery list apps available, some free and some paid, and it all depends on your preference. You can even use your phone's native list or note-taking app if you don't want to install something else. Although I don't use it, you can create an account with many of these grocery apps, allowing you to access your list from your desktop computer, and share with other family members, so anyone can add items they need. I'm a huge fan of to-do lists or checklists, although when I'm at work, I still employ a notebook to keep track of my tasks and reminders. For my blog organization and personal tasks, I'm a big fan of Todoist. Without using a lot of paper, and losing reminders all over my car, I can keep myself mostly organized. When it comes to saving links, small reminders, or travel packing lists, I'm all about Google Keep. I love that you can make checklists there as well (and I've noticed they've worked to tailor it to grocery lists recently). I keep lots of random reminders in my Google Keep (although I didn't photograph all of those, heh.) 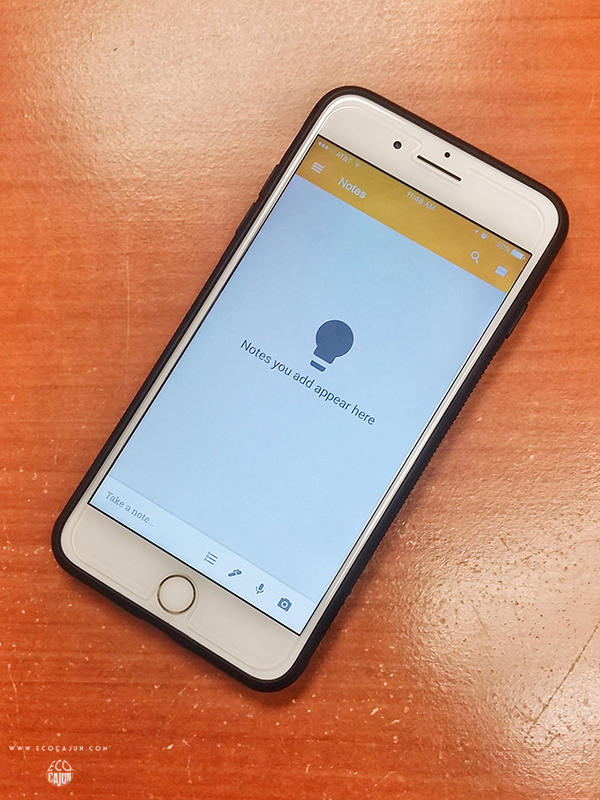 You can add alerts to notes and receive push notifications, which can come in handy. Side note, your phone's native note-taking app probably does many of the same things, but I'm not sure I've opened my Apple notes app once since I got this phone seven months ago. In the same vein as Google Keep, Google Docs and Sheets are helpful ways to keep information while saving on paper, and with the Google Drive app, you can access your documents on your phone as well. I'm not a big sticky note user (except for one long-term sticky note reminding the cleaning lady not to throw flowers in my office away...again), and I haven't gotten into using the sticky note program on my computer. But if you're a sticky note fan, this is an option that allows you to skip the paper notes. I believe it's built into all versions of Windows, and if I remember correctly, Macs have a similar app. Other options for paperlessly saving notes or links include Evernote or Microsoft OneNote, or anything similar to these. I've tried to get into Evernote, but it's never stuck and become part of my routine. Look for apps that sync across devices and people, giving you a seamless way to switch between whatever you're working on at the time. Beyond websites and phone apps, another way you can make an impact in going paperless every day is by declining paper receipts. Granted, most of the time, that just means the automatically printed receipt gets thrown away by the cashier, but it still keeps you from having a mountain of useless, BPA-laden receipts in your car or purse. When you're at the gas station and the machine asks if you want a receipt, say no and avoid the printing altogether. If you have the option of receiving an emailed receipt instead of a paper one, take it! I know Fresh Market offers them, and Home Depot allows you to choose one or both. Use apps for coupons as well, instead of printing and clipping paper coupons. This is one area I definitely need to get in the habit of, so I can save a little extra money! There are dedicated coupon/rebate apps, and many store apps offer their own coupons as well, like Target and Whole Foods. What are some other ways you can think of to go paperless in your daily routine?